People walk on the sidewalk during snowy weather in Kingston, Ont., on Jan. 30, 2019. According to experts, these co-existing extremes have been predicted for some time – and they’re likely here to stay. The exact role climate change plays in the pattern’s changes is a continuing discussion in the scientific community, but a common belief says it’s the result of a warming Arctic. “It’s thought that as the Arctic warms up because the ice is melting back, we’re going to have more of a situation where you have what we call ‘waviness’ in the polar vortex,” Dr. Gajewski said. This “waviness” in the upper wind’s pattern could be carrying cold farther and farther south into southern and Central Canada, and pushing warm air further north along the coast. As an example, Dr. Moore pointed to the theory that the waves in upper wind patterns are moving slower, with larger amplitudes as a possible result of warming in the Arctic. This interconnectedness of the world’s climate system also explains the effects from El Nino systems on Canada, Dr. Moore said. 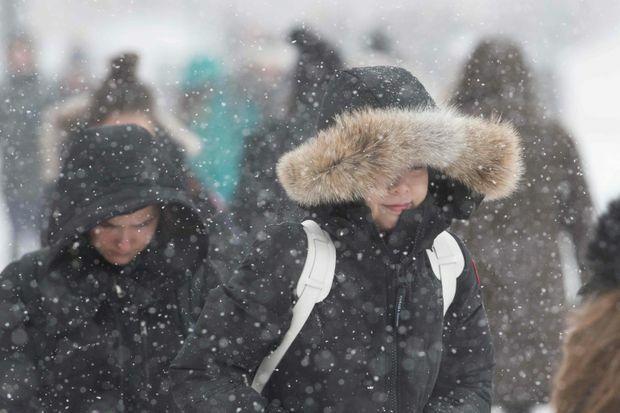 Dr. Gajewski said the arrival of long-predicted weather patterns means it’s time for all levels of government to seriously plan for changes that are already hitting Canada in the form of sweltering heat waves in the summer and record cold in the winter. In Ottawa, Dr. Gajewski pointed to some continuing local efforts such as more bicycle lanes and efforts to plow some of them in the winter. For cities such as Ottawa, which just completed its 12th straight day of round-the-clock plowing, people shouldn’t plan to retire their shovels any time soon.